This exercise is an oblique variation of the double toe taps. The slight rotation of the knees guarantees a challenge to rotational forces in the oblique abdominals. To do this exercise you will need a mat. Start by lying on your back with your legs in a tabletop position and with your hands clasped like a hammock behind your head. 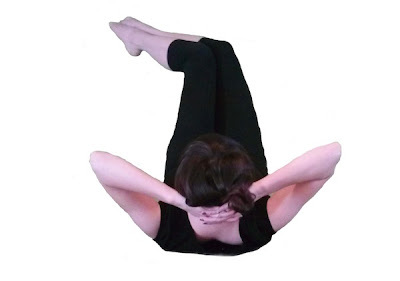 Inhale into the back of the ribs and then exhale as you narrow the ribcage, and press the ribcage into the ground to lift the head, neck, and shoulders. Inhale here as you point your knees to the right side of the body, and then exhale as you tap the toes on the ground continuing to point the toes to the side. Then inhale as you lift the knees back to a tabletop position and then rotate the knees to point to the left side of the body. Exhale as you repeat the exercise on the other side. Continue alternating as your repeat 8-10 times alternating sides. If you have osteoporosis you can do this exercise with your head, neck, and shoulders on the ground. You can also do this exercise with your pelvis on a soft ball to increase the challenge. When you are rotating the knees to one side it is important that the pelvis stays still. Often one hip likes to hike to the ribcage, or the pelvis likes to roll to one side or the other. Part of the pelvis stability work occurs when a body is able to rotate the legs without affecting the pelvis.